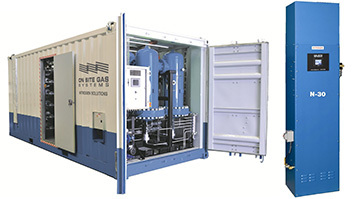 On Site Gas Systems are an Australian owed company that specializes in the design and manufacture of packaged nitrogen generation and oxygen generation systems. 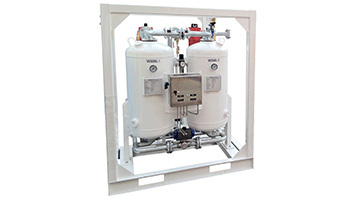 We locally design and build nitrogen gas generators for severe service in oil, gas, mining, utilities and related industries as well as package more complex turnkey nitrogen or oxygen systems out of our Sydney facility. We are partnered with OSGS Inc, a USA manufacturer that are pioneers in oxygen and nitrogen generator technology and we distribute their oxygen generation and nitrogen generation technology across Australia for general industrial applications. Through our local manufacturing and partnership with ON Site Gas Systems in the USA, we cover a wide range of industries from oil, gas and mining to food and beverage processing and packaging, to laser cutting, chemical, electronics manufacturing, laboratories, veterinary and many other general industrial applications. Our product focus extends to desiccant air dryers, gas detection and gas analysers and nitrogen and oxygen cylinder filling systems. Our systems can be customized to suit your exact application and requirements all whilst saving you money, just ask us how. We have systems in use by most major oil and gas operators, tier one contracting and mechanical service companies both on and offshore as well as systems with premier coal miners. Our general industrial nitrogen generators, industrial oxygen and medical oxygen generators are operating in mission critical applications for processes for which most of us rely on a daily basis – from food and beverage such as wine and coffee production and packaging, dairy and powdered products that you see on your supermarket shelf to major hospitals in most capital cities in Australia. 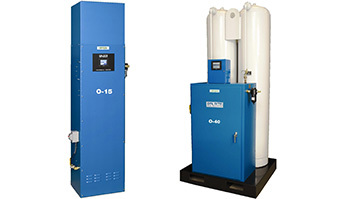 Our industrial nitrogen and oxygen generators have over 30 years manufacturing history and development behind them and can be found operating in over 100 countries around the world. Our business including local design and manufacturing is ISO9001 and AS4801 certified so you can be comfortable that you are talking to the experts in the field that are committed to delivering quality product and service. If you want save money then it is hard to look past on site nitrogen generation or on site oxygen generation. With costs to generate gas as low as 3c per cubic meter of nitrogen, our industrial systems will save you up to 90% on your current gas costs. Based on experience, we usually see paybacks in less than 2 years, so if you need to save money then call us and find out more. Your only question should be why you did not look into this years ago. We pride ourselves on providing our customers with exceptional service and producing the highest quality systems that represent outstanding value for money. Our technology delivers low-cost long-term and reliable solutions for businesses. Discover more about how we can help your business and get in touch today by calling 1300 953 699. We will be happy to answer your questions and help you choose the ideal system for your requirements.